Barren patches of salty farmland, often many acres in size, have caught the attention of two organizations that are interested in fixing the problem. 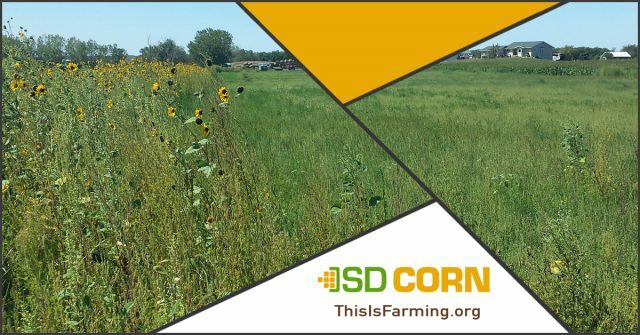 The South Dakota Corn Growers Association and Pheasants Forever are participating in a groundbreaking partnership designed to restore vegetation to unproductive soil with high saline or sodic content and in turn establish habitat for pheasants and other wildlife. This partnership is significant because it’s the first of its kind in South Dakota. In addition, both Pheasants Forever and the South Dakota Corn Growers Association understand that working with landowners is an important aspect in helping establish habitat. Each organization has pledged $100,000 toward the soil health program. Pheasants Forever did a pilot program two years ago in several South Dakota counties, using money from the South Dakota Conservation Fund that was established after South Dakota Governor Dennis Daugaard’s 2013 Habitat Summit. Redfield farmer Steve Masat participated in the pilot program with 35 to 45 acres of high-salt soil. “We have farmers and wildlife groups working together, so it’s farmer-friendly and hunter-friendly,” he added. The program helps farmers establish vegetation on the affected areas, which improves the soil and provides habitat for pheasants. Vegetation also reduces water runoff and wind erosion. The Natural Resources Conservation Service reports that South Dakota has 2 million acres impacted by saline/sodic soils and an additional 10 million acres categorized as threatened. The effort will begin with 4,000 acres enrolled. The partners are applying for a grant that will allow the program to grow. Salts occur naturally in soils and can be caused by processes such as erosion and mineral weathering.